QRV on all bands, even with restricted space... the BB-7V antenna is 6.7m long and has a max. power load of 250W PEP. The SWR above 3MHz is, depending on surroundings, at 2:1 or better. On some bands a simple tuner is required, the built-in tuners of many rigs are usually sufficient. 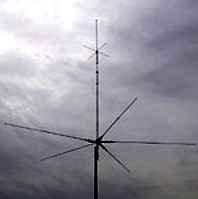 The BB-7V is a wideband antenna, so it works also outside the amateur bands. Simple installation, no alignment required. The antenna does not require radials, the radiator is grounded. Vertical antenna for shortwave and V/UHF. A small antenna for radio amateurs with space restrictions. Allows operation on 80, 40, 20, 15 und 10m, plus VHF 2m and UHF 70cm! Gain on 2m is 2.1dBi, on 70cm 5.5dBi. Max. power 200W SSB (3.5 - 50 MHz), 150W FM (50 - 440MHz). Total length 2.7m, length of five lower radials approx. 1.5m, weight 2.4kg, max. wind speed 125km/h. For operation on HF no further radials are required! The center frequency can be adjusted for each band. Due to the shortened design of the antenna the usable bandwith can be limited, a tuner might be required. Antenna for 7, 14, 21, 28 and 50MHz, length only 3.6m, max. power load 500W SSB on 28/50MHz, 400W SSB on 14 & 21 MHz, 200W SSB on 14MHz. As with the CP-6 the radials can be mounted on onde side only. Max. wind speed up to 160km/h.